The strange thing about the confrontation, at least at first, of the troops and the protesters at the Pentagon was that there seemed almost to be a rapport, partly contrived but also partly natural. 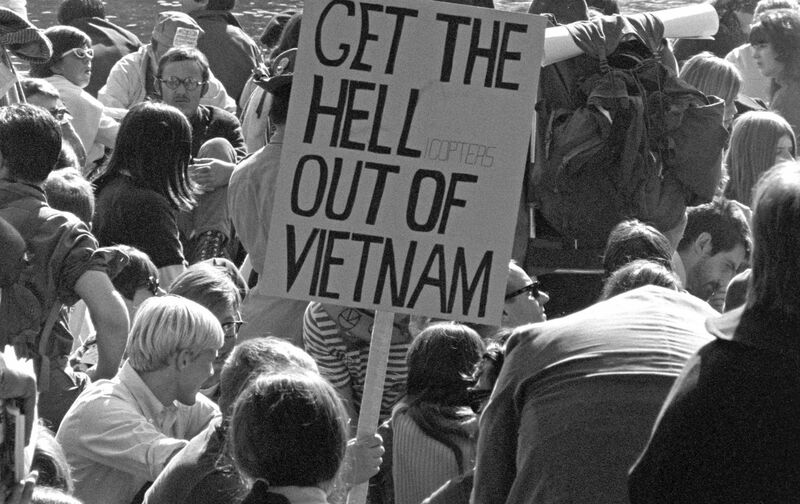 The troops who met the marchers and turned them away were sometimes cursed, but more often they were merely lectured as flower children might lecture a nosy cop in DuPont Circle. One boy stuck chrysanthemums in the muzzles of the rifles confronting him; late in the day, a soldier was seen tossing a package of cigarettes into the sprawl of sit-inners he was guarding. More significant than these random, amiable acts, however, was the fact that the protesters, although they made repeated forays with their identifying banners onto forbidden territory (one participant said it reminded him of the schoolboy game, Capture the Flag), never seriously contested or baited the troops physically—except for the one occasion when half a dozen protesters outflanked the main cluster of soldiers, raced through an unguarded Pentagon door, and made their coup, before being tossed out. A handful of stones, a couple of bottles, a few pieces of heavy cardboard were tossed at the soldiers during the day—but considering the size of the crowd, at peak emotion, acting over a period of several hours, these peaceniks were really peaceful. And by day, so were the troops. At dusk, they shot a couple of canisters of tear gas into the protesters’ ranks; and after dark they used their boots and rifle butts more freely than they had during the day…. On the occasion of the actual penetration of the Pentagon, there was rough stuff on both sides, but the only brutalities were committed by the marshals. When the protesters raced for the Pentagon entrance, The Nation’s reporter was in the van, not fast enough to get into the building with the six who made it, but in time to reach the doorway just as the bodies came hurtling back through, borne on a wave of soldiers. In the midst of this, he observed, one of the protesters was knocked down and lay imprisoned among the legs of the soldiers. A marshal seized this opportunity to start beating the helpless young man with all his might. and the beating continued for so long and seemed of such homicidal intent that the several newsmen caught in the crush began screaming at the marshal to quit. Finally the soldiers stopped him. The Nation’s reporter saw the marshals beating demonstrators on five occasions, four of these beatings were administered when the demonstrators were either on the ground or helpless.